Fast, quiet and the younger brother to the busier and older Eastern Way, Western Way opened in 1975(?) as a bypass to the busy A27 West Street, plugging in nicely to the improvements being made in West End. Starting at the Quay Street Roundabout, which was shrank to accommodate the new road (doing without a large loop under the viaduct to Gosport Road, and also the access to Hartlands Road, which is now disconnected from this end of the network). Seven houses on Portland Street had to be demolished in addition to four on Hartlands Road. It then followed the railway line, attempting to use its ancient embankments to steer clear of existing structures. It still took over approximately 40 houses in Western Road, taking the majority of the houses in that street. These houses had only lasted about 30 years. Next it crossed a church hall and graveyard (the rest of which has since been developed as retirement housing), and then the allotments around the back of the Crescent Road housing. It takes a bridge over The Gilles (marked by a slight rise in the road itself), where there was a scout hut, car park and small industrial units. After this it curves inwards to meet the newly-dualled old road, in to an area which was mostly industrial and light retail - having cropped up to benefit from the arrival of the railway. The West End Inn was the most notable casualty. 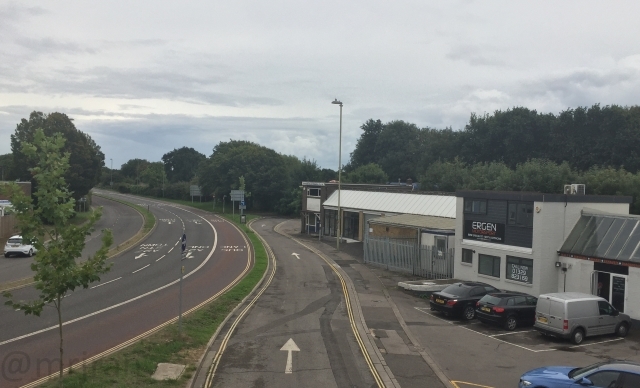 These losses were replaced by new retail and industrial units surrounding the new road layout, such as Maytree Road and Delme Court. The then-new Station Roundabout featured two pinnacles of 1970s planning: an unnecessarily grand footbridge and a subway to make life as inconvenient as possible for anybody not in a car.